sans serif records with deep regret the passing of the Editorial Chairman of Outlook magazine, Vinod Mehta, in New Delhi on Sunday, 8 March 2015. He was 73 years old and had been ailing for some time. He leaves behind his wife Sumita Paul, their canine companion, “Editor”, two brothers and a sister—and legions of orphaned colleagues, compatriots and competitors. As the founding Editor-in-Chief of Outlook, Mr Mehta re-energised Indian magazine journalism with a freshness of approach, an openness of spirit, and a lightness of touch. All through his long innings as editor, writer and a television talking head, Mr Mehta brought trademark wit, candour, and non-partisanship to the table, endearing him to readers and viewers, and to friends and foes, across the country and across the globe. Rare is the rival who can’t find a good word. Editor from the day he stepped into journalism from the advertising world in 1974, Mr Mehta’s first job was as editor of the monthly men’s magazine, Debonair. He founded India’s first weekly newspaper, The Sunday Observer, from where he went on to edit The Indian Post and The Independent in what was then Bombay. Mr Mehta moved to Delhi in the early 1990s, when he became Editor-in-Chief of The Pioneer, but his 17-year helmsmanship of Outlook magazine was his longest tenure. He was president of the Editors Guild of India and was, briefly, the writer and presenter of “Letter from India” on the BBC World Service and BBC Radio 4. Born in Rawalpindi and brought up in Lucknow, the self-proclaimed “BA, second class” was the author of six books, three of which were biographies (Bombay, Sanjay Gandhi and Meena Kumari), two were memoirs (Lucknow Boy and Editor Unplugged), one was a compilation (Mr Editor, how close are you to the PM?”). An undisguised cricket fanatic and foodie, Mr Mehta was a magnet of tasteful gossip which he deftly let loose into the system through his widely read diaries on the last page of Outlook. Mr Mehta disliked hyperbole and big words. His motto in journalism was to make the important interesting, but Indian journalism is decidedly poorer today with the disappearance of a lodestar of professional integrity, on whom could easily be placed the sobriquet The Last Great Editor. 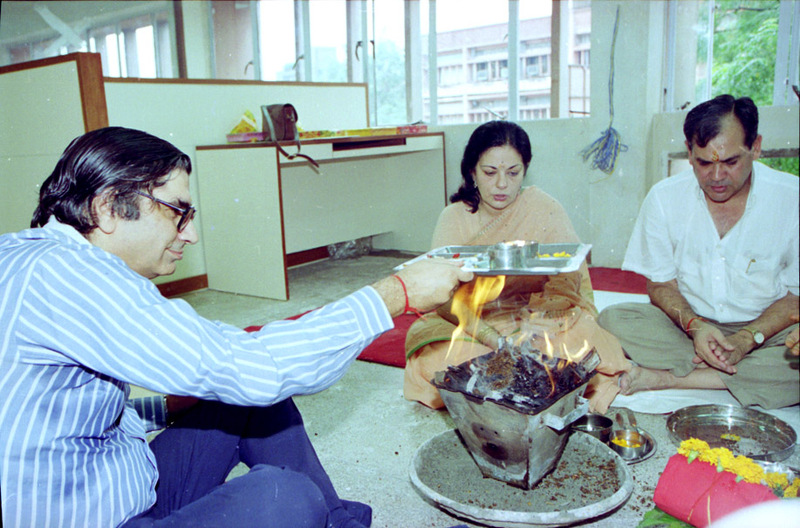 Photograph: Vinod Mehta (left) with Deepak Shourie and Jyotsna Shourie at the ground-breaking ceremony for the launch of Outlook in 1995. ‘Any man’s death diminishes me, because I am involved in Mankind; And therefore never send to know for whom the bell tolls; it tolls for thee.’- John Donne. Vinod Mehta’s passing away is a great loss to Indian journalism.He was my hero. We all loved Vinod Mehta, who was a lovely strong individual an Old Martinian, May his soul RIP and may all his loved ones be able to bear this terrible loss. I loved reading Vinod Mehta, every single word he wrote in the last decade. He was witty and political, and he wore his erudition lightly. His gentle rebelliousness certainly “afflicted the comfortable,” especially those seeking public office, even if it did not also “comfort the afflicted.” He was an opinion peddler par excellence — in every good sense of the term. He liked to believe, often incorrectly, that he held liberal positions. He mentored many talented writers and editors, including the one who operates Sans Serif. He carved a noble path in a great profession, leaving a charming legacy in words and in influence. My heartfelt condolences to his family, including his beloved dog Editor, and to his Outlook colleagues. Vinod Mehta should be admired (despite his many faults), for his candour: ‘no journalist could be completely objective or politically neutral’; ‘I’m a Sonia Gandhi chamcha’. He should also be admired for providing a platform to his critics in OUTLOOK’s ‘Letters to the Editor’ columns. May Bhagawan bless his soul with eternal peace! Non partisan? Are you delusional? He was a congress chamcha through and through and played a good role in why we general public loath you media wallahs and give you terms of endearment like presstitutes. Journalism in India is regarded by most of us as the pits and the place where the corrupt wheeler dealers congregate.